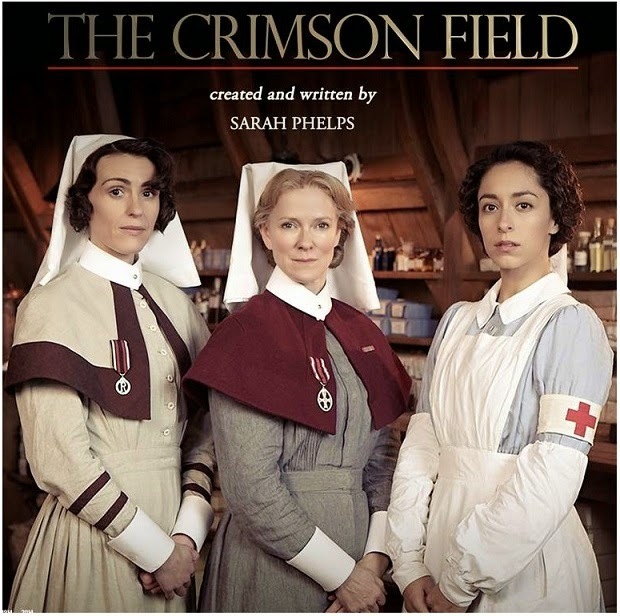 And after THE MUSKETEERS have ended their adventures in the first season last week at BBC their Sunday evening spot was taken by THE CRIMSON FIELD epic historical series which debuted this weekend with high ratings in UK. 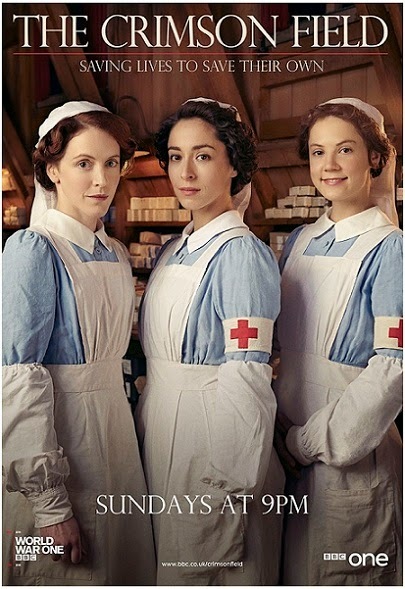 Marking the first 100 years from the beginning of the World War One in six episodes, the mini series tells the touching and intriguing story of a team of doctors, nurses and women volunteers working together in a fictional field hospital at the beginning of the 20th century to heal the bodies and souls of men wounded in the trenches of the First World War. Exploring the human impact of the First World War and paying tribute to the millions who sacrificed their lives, the story begins a year into the war, in 1915, when soaring numbers of casualties resulted in a call for hospital volunteers. Hermione Norris plays Grace Carter, the matron of a French field hospital, Surrane Jones plays sister Joan Livesey, a woman ahead of her time who makes her grand entrance on a motorbike. 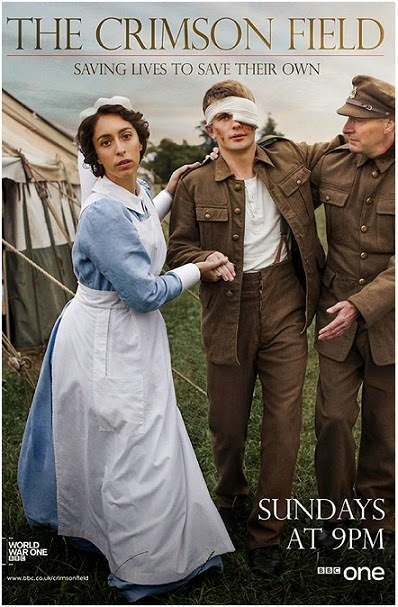 Oona Chaplin plays Kitty Trevelyan, one of the hospital’s first VADs (Voluntary Aid Detachment), who arrives with emotional baggage and a chip on her shoulder. 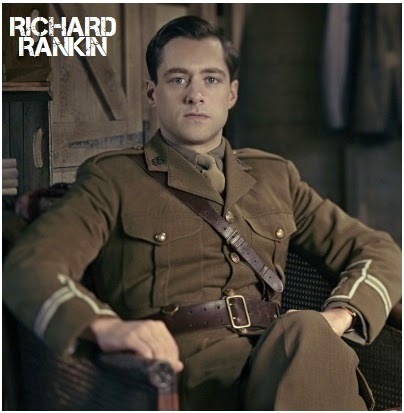 Richard Rankin is Captain Thomas Gillan, a brilliant surgeon but socially awkward and abrupt to the point of rudeness. Alex Wyndham plays Captain Miles Hesketh Thorne, a deep hearted and caring surgeon but when he puts down the knife he’s quickly off in search of a good time. Kevin Doyle is Lieutenant Colonel Roland Brett, the fiercely loyal and morally centred head of the hospital. I haven't had time to start the Crimson Field yet, but I've got it marked as something see. Probably will have to wait for it to come out on Netflix, since this spring and summer are crazy at our house. The fashion was horrid in the 80's. The clothes, the hair, even the music sucked donkey balls. I remember those shoulder pads. You couldn't buy a dress or a blouse without them in it. I'm a 60's and 70's person and by the 80's I was old enough that thematically the music was no longer relevant to what was going on today. Also I hated that hair band rock music. That is a very old photo of Sean Astin. Definitely pre Samwise Gamgee. One of my publishers released CALL THE MIDWIFE book too last year. I watched a few episodes but they were a bit too slow paced for me. But good acting in it. I love BBC approach but they really have a problem with writing in recent years. Call the Midwife was one of my absolute favourties. The characters were so good and the stories so touching. No, it takes the Brits to hit that tone perfectly. I still have to see the first Goonies. PS: I made a sage and butter gravy over the weekend that was killer good. Oh my gosh. We don't have cable tv darling. There is so much absolutely wretched things that are bad for society on there that we refuse to pay that huge sum of money for it. The Netflix is cheap and you don't get adverts or their horrid News stations with it. me likes the goonies, looking forward to a new film. I am an 80's gal thru and thru! Don't get me started on the music! Sorry....didn't mean to get carried away! Me too... so I can flush them down my Flushmaster 2000 or burn them. Unless, of course they're great. Then I won't. My kids and I spent many wonderful hours watching 80's movies and listening to 80's music....They STILL love the music! And the music videos...they were THE BEST! @Linda - I know. I love the eighties. I am 43. Hello! I was talking about those remakes. I can't stand them. Don't touch our classics. I wasn't.... I'm always misunderstood. Even by Linda boo hoo hoo. Say what... D-Day? Dezzzzzy Day? Happy Birthday to you Dezzman Day? Good thing I know. Old... you're not old. No chocolate... So what do you do with it? Crimson Field sounds like it could be enthralling. I love The Goonies so much I own the movie. Let the WWI historical dramas begin! That's right! Anyone who thinks he can redo Leslie Nielsen (I mean redo his Naked Gun... um... Naked Gun series) is a fool and plain rude to a guy who chose Let 'er rip" as his epitaph. Come on! DON'T TOUCH IT!!!! me too, Theresa, I'm happy that I'm an 80's child too. I wouldn't mind seeing Ed Helms' naked gun... Is Leslie still alive? I haven't seen him in ages. Leslie has been gone for over three years, Dezz. Something to do with his lungs if I remember correctly. Poor guy. I loved his sense of humor. Inimitable. Crimson Field was OK, I'll look forward to the Goonies, I always loved that film. I actually haven't seen Goonies yet. I'm against these 80s remakes. Why remake them when the originals were fantastic? That's right. Say it again. No one's listening but us. hope it will start soon in France since it takes place there! 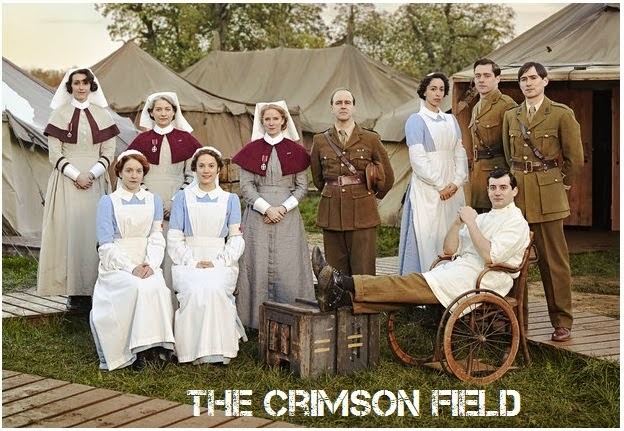 I love, love the idea of Crimson Field. I love the First World War and it does not get nearly the attention that second one does. WWI is where everything started and there were so many lost lives and stories people need to know about. 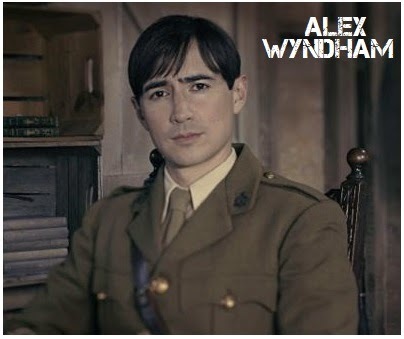 The Crimson Field looks the goods - the Beeb usually do historical well (in that they don't often offend with historical revisionism ala Hollywood). Re poor Serbia in WW1 - the figures were even worse than you quote. Serbia had the highest casualty figures as a percentage of poulation for any nation in WW1. Recorded deaths are quoted as high as 800,000+ with at least 150,000 military and over double that for civilians - out of a population of just over 4 million. It amounted to over 18% - nearly three times that of any other country. But its very hard to estimate as in the 'Trail of Tears' - the great retreat across Albania to the Dalmation coast nearly half the population fled with the army. The army was about 120,000 at the start of the retreat - the Allies evacuated about 40-50,000 survivors. There are no records for the numbers of civilians lost but I've read of some estimates of up to 500,000. That was in 1915, early in the war. Its just one of the more important stories of WW1 that's often overlooked because of Serbia's equally dreadful experience in WW2. But its a story that should be told.